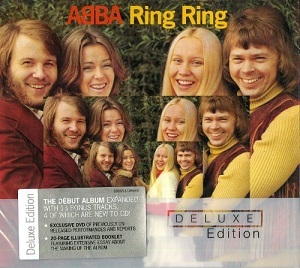 Following the Deluxe editions of Abba's "The Visitors", and "Abba", the band's 1973 debut album "Ring Ring" is being given the Deluxe edition tratment. The album features classic hits such as ‘People need love’, ‘Ring ring’ and ‘Nina, pretty ballerina’. The first disc in the package is a remastered version of the original album plus four bonus tracks. The second disc is a DVD, featuring 15 minutes of previously unreleased footage. The package also includes a 20-page booklet featuring lots of information about the band and the making of the album, as well as information on the bonus tracks and the material included on the DVD. The booklet is definitely well worth a read as it contains far more information than these things typically do. So, is it worth buying? If you haven't got the album then yes it's definitely worth getting this version as you get the album plus the bonus tracks and the DVD. If you've got the album already then the main attraction will be the DVD and the bonus tracks. Personally I'd say yes it's worth getting but it all depends how much of an ABBA fan you are and if you're likely to watch the DVD more than once. Once again Universal have released an excellent deluxe edition package for a classic album. A very good reissue of a great album - well worth buying.